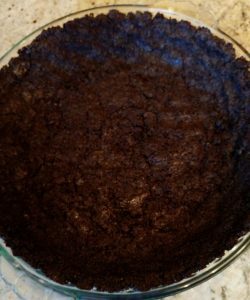 Next: Chocolate Bourbon Pecan Pie Recipe – Dairy-Free! Can you believe it’s almost Thanksgiving!? How time flies by! Are you hosting? Or are you going to a friend’s or family’s home? Either way– want to make a scrumptious, noteworthy, memorable dessert to share?! 1) It’s EASY. Whip it up in less than an hour, in one bowl. 2) It can be easily doubled. Because sometimes you have lots of mouths to feed! 3) It’s impressive and sophisticated, yet kid-friendly too. 4) It’s dairy-free! But you’d never guess that it’s any different from its dairy counterpart. And my gosh, now I’m hooked!! This pie is so creamy. So satisfying. It has just the right about of sweetness combined with the luscious pumpkinyness (totally a word). 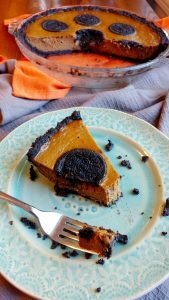 Plus that Oreo crust adds a chocolate flavor that just WORKS. Trust me, it just does!! Plus, whether you need it to be or not, this pumpkin pie is dairy-free! Coconut milk and cornstarch combine to create the perfect pumpkin pie consistency, without the cream! PLUS, you can make it all using just one bowl! And in about 30 minutes. 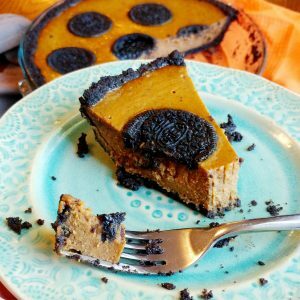 Quick, easy, impressive, delicious… you need this on your Thanksgiving table!! The recipe below is for one pie, which’ll serve about 8-10 of your friends & family. Have a big family? The recipe can easily be doubled to make 2 pies! You can bake them side-by-side in the oven. I know y’all have lots to do this week – let’s get that baking going! 2. Put the Oreos into a food processor. Grind ’em up until you have Oreo crumbs the consistency of sand. 3. Pour the crumbs into a bowl. Add in the melted coconut oil and mix them together. 4. 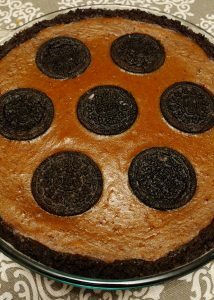 Press the Oreo mixture into a pie plate. You don’t need to grease the pie plate, but you can if you want to. 5. Bake the pie in the 350 degree oven for just about 5 minutes. In the meantime, whip up the pie filling! 6. In that same bowl that you made the crust in, whisk all of your ingredients together. It’s SO EASY!! You can probably do it in about 5 minutes, and then, your crust will be ready! 7. After the crust has been in for 5 minutes, take it out of the oven. Bump the heat up on your oven to 425 degrees F.
8. 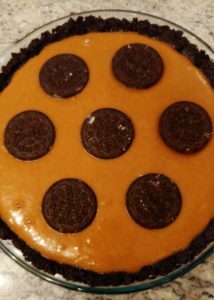 Pour the filling slowly into the pie plate over the Oreo crust. 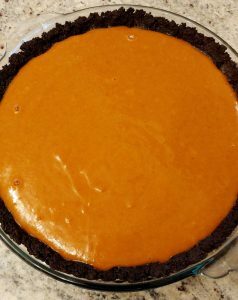 The filling should come up right to the top of the pie plate, without being too full. You should still be able to see the crust all around the top edges. 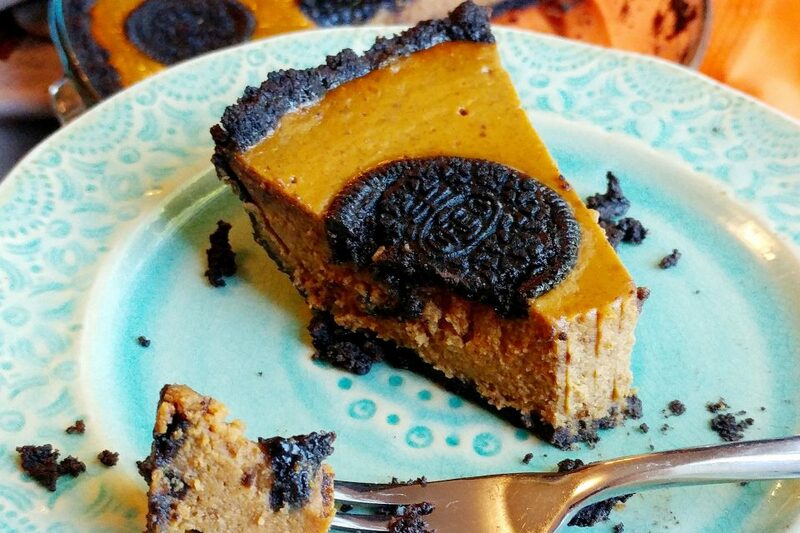 Oh yeah, and place some whole Oreos on top of the pie, for looks + extra Oreoness, if you’re into that like me. 11. Bake the pie for 15 minutes. After 15 minutes, turn the heat down to 350 degrees F, and bake for 40-45 minutes. It’s done when it doesn’t look as wet, and it has firmed up. It shouldn’t be gooey. You’ll see what I mean! 12. Allow the pie to cool completely on a wire cooling rack. In all honesty, the first time I made this, we tried it after ~ 2 hours of cooling, so it was still warm. It was fun to have warm! With dairy-free vanilla ice cream, a little melty…. BUT, if that pumpkin pie consistency is what you’re after, I’d cool it first. Once it’s cooled completely, wrap it with foil or cling wrap and put it in the fridge for at least 1 hour, or overnight. I hope you, your friends, & family enjoy, and have the most wonderful Thanksgiving!! As always when you’re baking, tag @thefetchingfoodie on Instagram! I can’t wait to see! Happy Thanksgiving!! I am Thankful for you!